Acer's new TravelMates are meant to do what a portable PC was originally conceived to do. As the dust from the Consumer Electronics Show (CES) settles, we can see the latest gadgets, gizmos and devices to empower the mobile PC user that have emerged from countless hardware vendors. New mobile PCs came in a variety of styles: There were touchscreens, convertibles and high-powered portable PCs galore from the likes of Dell, HP, and Lenovo. While those major players in the business and consumer PC world were going for pizzazz, Acer Computer was looking to leverage the original paradigm of the notebook and ultrabook PC. The company quietly introduced it’s latest iteration of the TravelMate X series, or more specifically, the TravelMate X3410. Available under three different configurations, the X3410 offers a limited set of options to keep prices down, yet all the critical features a business user needs are in place. You won’t find touchscreens, OLEDs or convertible tops on the latest business-class ultrabooks from Acer. But you will find a 14-inch FHD (1920×1080) IPS display and plenty of ports, including a full-sized SD card reader, gigabit Ethernet, an HDMI port, three USB 3.0 ports, a USB 3.1 Gen 1 Type-C port, a headset jack and a legacy VGA port. All of that is packed into a thin and attractive case. 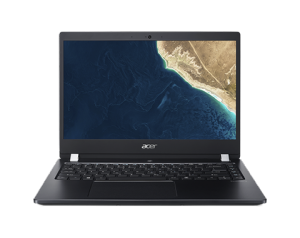 Acer saves significant coin for those looking for high performance in a compact and inexpensive ultrabook by eschewing some of the frills found in most competitors. The company claims the TravelMate X3410 is ideal for the traveling business professional and can provide as much as 15 hours of battery life on a single charge. From a durability standpoint, the company says the Acer TravelMate X3410 series meets eight U.S. military testing standards (MIL-STD 810G). The X3410 also includes a one-year international warranty. Acer supports partners through the company’s Synergy Partner Portal, which offers the expected spiffs and channel support to which traditional resellers have become accustomed. The X3410’s primary strengths can be found in performance and affordability; however, fickle buyers looking for the latest features, such as a touchscreen, pen support or a tablet mode best look elsewhere. The TravelMate X3410 might never fall into the category of executive jewelry, but it should make those that rely on portability, a good keyboard and ample battery life happy enough to tackle most any task. Successfully selling the TravelMate X3410 will require a modicum of common sense and the ability to convince buyers that they might not need to the expense of pizzazz to accomplish their job. A recent cloud deal and Android MSP news underline the web titan's need for channel help.